Contextual Ear Training is one of 1st Books to use When Starting Bruce Arnold’s Ear Training Method. This is an exciting new addition to the Contextual Ear Training course: The Voice Edition found on this page uses voices to form the key center and gives you the answer with either a Tenor, Alto or Soprano sung voice. For many students who struggle with ear training, the Voice Edition is a lot easier, especially if you pick an edition that is similar to your own vocal range. If you are just getting started with the Bruce Arnold System of Ear Training and want to see improvement at a faster rate, then this is one of the must-own courses. In general men should choose Tenor and possibly Alto, and women either Alto or Soprano. 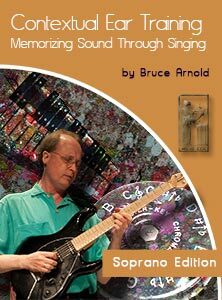 Please keep in mind that Bruce Arnold recommends that you work with two levels, so it is much more cost effective to order the Complete Voice Edition. For instance, if you are a male it is recommended that you do both the Tenor and Alto Versions. If you are a female do both the Alto and Soprano versions. The exercises found in this course are similar to the 1st assignment in the Fanatic’s Guide to Ear Training and Sight Singing. The main difference is you can do the exercises found in Contextual Ear Training anywhere that you can listen to an MP3 player, which is just about anywhere, whereas the exercises in the Fanatic’s Guide require you have your instrument on hand to check your answer. Soprano, Alto and Tenor Versions. Each version tests you at 3 different speeds. There are 864 MP3s for the Soprano, Alto and Tenor Courses. This includes all degrees in both major and minor keys at 3 different speeds. As previously stated it is recommended that you work with two voices before moving on to the next level in this ear training method. Each level is available separately but it is more cost effective to order the Complete Voice Edition. Make sure to check out the Level 3 example for the Tenor Voice. Having extremely fast ability with this method is VERY important if you want to realize your full potential. The faster you are will also effect your sight singing ability when actually reading real music. Below is an example track from the Soprano Edition of this series. This Level One track plays you a F Major cadence then asks you to sing a Flat 3. Below is an example track from the Soprano Edition of this series. This Level Two track plays you a C Minor cadence then asks you to sing a Flat 5. Below is an example track from the Soprano Edition of this series. This Level Three track plays you a B Major cadence then asks you to sing a Flat 2. Below is an example track from the Alto Edition of this series. This Level One track plays you a A Major cadence then asks you to sing the Fifth. Below is an example track from the Alto Edition of this series. This Level Two track plays you an C# Minor cadence then asks you to sing a the 6th. Below is an example track from the Alto Edition of this series. This Level Three track plays you an D# Minor cadence then asks you to sing a minor 3rd. Below is an example track from the Tenor Edition of this series. This Level One track plays you a B Major cadence then asks you to sing the Flat 5. Below is an example track from the Tenor Edition of this series. This Level Two track plays you a F Major cadence then asks you to sing the Flat 6th. Below is an example track from the Tenor Edition of this series. This Level Three track plays you a A# Minor cadence then asks you to sing the Second. The idea of singing sound based on a “key center” as opposed to an singing an “interval” really began a revolution in the way musicians perceive sound. When a seasoned musician sings a melody they are not thinking the distance between each note they are hearing that they are singing as pitches within a “key center.” Seasoned musicians sing this way naturally after years of playing and singing but with Contextual Ear Training a student can fast forward their learning so that they can experience 30 years of ear training experience in a fraction of the time. You can sing an interval but are totally lost when you try to apply it to real music. Not being able to find the first note of melody when you start singing a song. You try to think the distance between each note as you try to sing or listen and get lost. If you are trying to sing each note as it flows by in music, there is no way that you can calculate the distance between each note even at a very slow tempo much less the usual speed that notes flow by in real time. The only way to instantly know what notes are being played is to engrain in your mind the sound of each note within a key center so that you know the sounds you are singing in the same way that you see the color blue and know it’s blue. You can sit in a classroom and do sing a Major 6th when a teacher ask you to but if you are trying to do this in time as you are singing real music the problem gets worse and worse the more complicated the music becomes. In the real world, when music is being played in real time, as a musician, your mind just cannot calculate the intervals and analyze what you need to know in order to react properly right away. This isn’t about intellectual ability, it’s about the reality of TIME. So how do musician identify the sounds they are singing instantaneously? Contextual Ear Training teaches you the “Key Center” process. By working with the audio files in the Contextual Ear Training over time, you gain the ability to sing the sound of all 12 notes with a “key center.” For some students this will be a quick and painless rebooting of the way they hear sound; for others it can be a frustrating path with many possible pitfalls. Ear Training is a two pronged process. You need to work on singing notes and internalize what they sound like in a “key center” but you also need to identifying sound as you hear them from an external source. Contextual Ear Training and Ear Training One Note Complete together make a great ear training program. Listening exercises found in Ear Training One Note Complete teach you to identify the sounds from external sources such as another band member or a song that you are hearing on your MP3 player. Singing exercises found in Contextual Ear Training help you identify the sounds you hear inside you when you are singing, improvising or composing. You need both sides of ear training to become a great musician. The good news is they complement each other so the more you work on one, the more it will the help the other. Some students can fly through this ear training with no problem. But many musicians have problems and need personal help. Luckily Mr. Arnold offers email support for students as they work through this process. So rest assured as you enter this ear training method that you are not alone, and you can get expert help if you run into problems. This method has been helping musicians for almost 20 years now. It’s one of the best selling methods Ear Training systems on the market. Simply put: It is successful because it works! BUT the secret weapon is Bruce Arnold. He is only an email way to help you. If you are a beginning or an advanced student seeking to perfect their skills, you can call on Bruce to help you through this process. Encouragement and hope that you can do this, and that it just takes daily dedication. The knowledge that EVERYONE that has really put their mind to it has mastered this ear training without exception. The knowledge that dedicating a short amount of time each day: 5 to 10 minutes 5 to 10 times a day will be all it takes to master this ear training. First let’s talk about how you will be doing this ear training. We have found that the best way to do this ear training is with an MP3 player. It allows for many more ways to organize the audio files and is very portable. We do offer physical books and CDs with with some of our ear training products but we HIGHLY recommend you not take this path with our ear training method. Digital downloads is a much better way to study this ear training because MP3s are much less expensive, easier to organize and cost half as much as physical books with CDs. We also have many ear training products that are ONLY available as digital downloads so it just makes more sense to go the digital route. So unless you REALLY only can use a CD player we sincerely recommend that you buy digital downloads of our ear training products. For singing we most commonly recommend students start with Contextual Ear Training. We do recommend along with Contextual Ear Training. that you also work with Ear Training One Note Complete. My 7 year old son and I really enjoy these materials by Bruce Arnold. We have One Note Complete, Contextual Ear Training, and Fanatic’s Guide to Ear Training and Sight Singing. We have been using One Note Intermediate and Contextual for just over one month. My son loves to do this ear training program, especially “name that note!” We home school, and we do Ear Training One Note and Contextual Ear Training as soon as we get out of bed, and then later in the school morning. I also do both programs later in the day, especially when I am working in the kitchen. My son almost always listens in, and sings along, or names the note, even when he is playing in the next room. After just one month, my son can accurately name all 7 diatonic notes, but none of the non-diatonic yet. I can accurately name C, D,G, and B. I can sometimes get A and F, and I hardly ever get E (yet!). For Contextual, both my son and I can sing Root (Do) for all the keys, although sometimes the minor keys do give us a bit of trouble. We can both sing 3 (Me) most of the time, but 3 still needs work. My son was able to sing 3 much sooner than me. I asked him how, and he said he “just knows what 3 sounds like.” As for me, I got every single 3 wrong for over two weeks, and I was doing them at least 5 to 7 times per day! Then one day, I started getting a few of them correct! Then within a few more days, I was getting most of them correct. This system really does work. After listening to the cadence, the sound of the 3 would just form in my mind. We have been singing 5 (So) for about a week. 5 is coming along much faster than 3. Both of us could sing some 5’s right away. We also continue to review Root and 3. This system is really fun to use and its working for us! Buy Contextual Ear Training and then contact Bruce Arnold with a detailed explanation of your level and goals. Ear Training is very specialized to a students goals and abilities. It makes a lot more sense to use the contact information at the bottom of this page to contact Bruce after you have purchased these books to see what other products you might consider and how to organize your practice. The Fanatic’s Guide to Ear Training and Sight Singing and Contextual Ear Training differences. Contextual Ear Training and The Fanatic’s Guide to Ear Training and Sight Singing are two closely related books. The 1st exercise and arguably the most important exercise for a beginning is the The Fanatic’s Guide to Ear Training and Sight Singing is the “One Note” exercise. This “One Note” exercise develops the ability to instantly sing any of the 12 pitches over a “key center.” Fanatic’s Guide to Ear Training and Sight Singing requires you to work with a CD and check answers with an instrument to do this exercise. Contextual Ear Training allows you to do this exercise anywhere because the answer is supplied in the audio files. Therefore you will improve quicker if you use the Contextual Ear Training “One Note” exercise because you can do it anywhere that you can use an MP3 player. We do occasional recommend both Contextual Ear Training and The Fanatic’s Guide to Ear Training and Sight Singing to students that are working in a choir or other places where they are reading music. Contextual Ear Training you are not singing notes from a page. It will help you to sing notes from a page once you gain the ability to hear all 12 notes of a “key center.” but it isn’t building your sight reading skills. The Fanatic’s Guide to Ear Training and Sight Singing does work with many exercises where you are singing notes from a musical staff. So if you are a singer where you need to work on both aspects of your musicianship we recommend both books. Where do I go after I finish Contextual Ear Training? This entry was posted in Ear Training and tagged bruce arnold, ear training lessons online, bruce arnold ear training, aural comprehension, aural skills, ear trainer, ear training tools, ear mastery, ear training tutor, ear training, aural training, contextual by Muse Eek. Bookmark the permalink.